So I have kind of been obsessed with string art this year. From everything to my “Home Sweet Home” board, my reverse string art word of the year sign, to my very own holiday string art product that is in Jo-Ann Fabric and Craft Stores. I love string art. So naturally my 6 year old daughter has taken a liking to it too. The only problem is she is 6 and wielding small nails and a hammer isn’t super feasible for her to do independtly. So usually I do the hammering and nailing and then she strings. Enter the Klutz String Art Activity Book and my daughter made a whole string art gallery wall for her room. I mean how cute is that for a 6 year old?!? I was so impressed with this book in particular but I will say, you can’t go wrong with any Klutz activity books. Every Christmas I buy my kids an activity book of some sort. Last year I bought the Klutz Pom Pom animals book for Kayla, and the Paper Airplane book for Isaac. This year Klutz sent me 5 of their activity books to try out. These have been such a treat for Kayla and I to do together. I will say the Pop Collage was my least favorite probably due to the fact that Kayla is only 6 so she doesn’t really understand the aspect of collaging. My second favorite was the Finger Knitting, following by the Shrink & Link Jewelry. Ok so back to the String Art. I wish I would have thought of this brilliant way for Kayla to do string art. There are no nails just push type pins with this little tool to make them all the same height. So first things first is you choose your paper to cover the 4 ply corrugated cardboard. All the papers are marked so you can center the paper and then you just use Scotch tape to tape the edges like you would a present. Of course, like her mama, she doesn’t want to just do one board she wants to do them all. Next Kayla picked out the designs she liked. Included in the package was template/transfer paper. 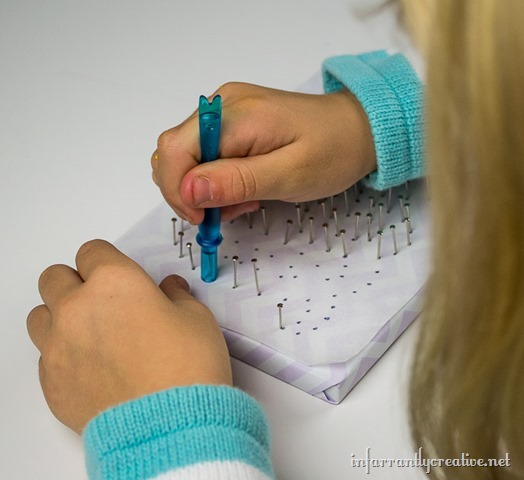 You simply put the paper over the design and use a Sharpie to mark your dots. Then you take your template and put it on top and stick your pins through your template into your paper covered cardboard. They have this enclosed tool that you use to push the pins in. No sore fingers from pushing – brilliant! Plus the little handy tool makes sure all the pins are pushed in the same height. Way easier than pounding them into wood! After all the pins are pushed in you simply rip away the template. Kayla was so proud of her creations. She worked on them a little at a time over 4 days. I backed them with some 3M Command Picture Hanging Strips and hung them on my studio wall just for picture purposes but they are actually hanging in Kayla’s room above her desk. They are so adorable. 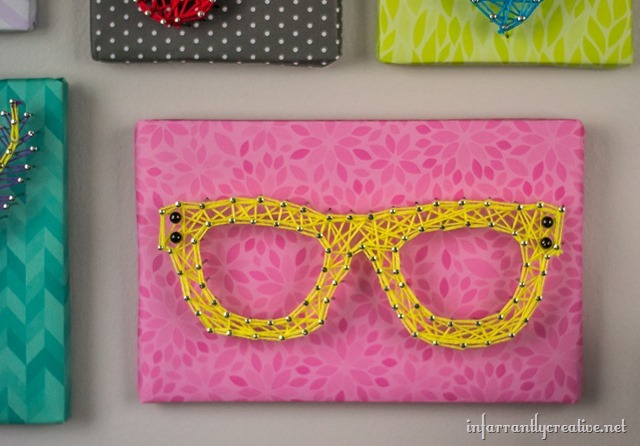 You can make a whole gallery wall of just string art. Plus these would make cute gifts to give the grandparents or teachers as a handmade gift. To learn more or see any of the other activity books that KLUTZ has to offer check out their site. Disclaimer: This post is sponsored by Klutz. All opinions are my own and all string art is courtesy of my daughter.